My days at Rock Canyon Elementary School, while decades ago, are still vivid in my mind. The book fairs, the cake walk at the Carnival Extravaganza, the human wax museum, the time I kissed Christie Asay and swerved my bike with joy so hard that I crashed and chipped my front tooth. Not all of these lasting memories were formative, but I want to tell you about one that gave me an idea for a cool giveaway as an author. Like any elementary, we would have parents come from time to time and tell us about their professions. Unlike any elementary, one of the students in my grade had a world famous painter for a father. I remember vividly sitting cross-legged on the library carpet as Greg Olsen showed us some of his imaginative and masterful artwork. What struck my eight-year-old brain the most, however, was the fact that he used kids in the neighborhood as models for some of his paintings. I’m not sure if I had ever been so jealous in my entire life than when I saw Chandler Smoot and Daniel somethingorother (I’m horrible with names, okay) immortalized in an awesome Greg Olsen piece. I wanted in! That feeling has stayed with me my entire life. The feeling of “life would be so much cooler if [X], and why doesn’t life work like that?” Most of the time life doesn’t work like that because older people control how life works and they have completely forgotten what they used to think was cool. Well, guess what? I haven’t forgotten! When I visit schools, my giveaways include a chance to get your name into the next book. For those not in classes that I visit, all you need to do for your chance to get into a Techno Wizard book is go to the bottom of the screen and subscribe. 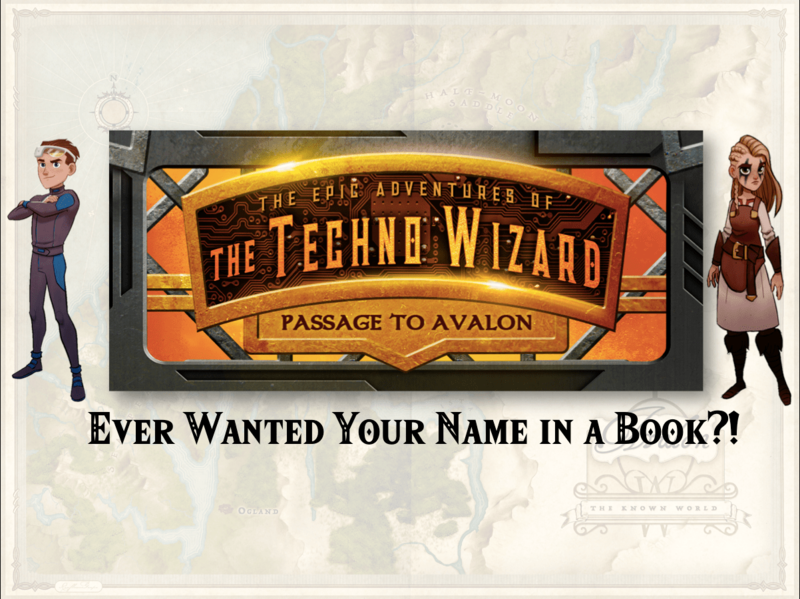 One out of every hundred will have their name chosen to be included in the next Techno Wizard book. It’s THAT simple. I haven’t forgotten what makes life cool, folks. Let’s make life cool again. Tagged Awesomeness, Passage to Avalon, Techno Wizard. Bookmark the permalink. Hi we bought one of your books at the renaissance fair, and I really like your book. Thank you so much for stopping by and giving Passage to Avalon a chance! Spread the word! Hope to have book 2 out before Christmas with any luck. Hi me ,my sisters ,and my cousins all bought your book in Havre and so far it’s really good! Boo yah! So awesome to see everyone turn out and get excited for the Techno Wizard. The book has some great twists and turns and epic moments (especially toward the end), so keep me posted how you like it as you go! I’m part way through book 2 and am wondering when book 3 is coming out. I’m almost halfway through the first draft and really hope to get it out to the public by June. I’ll keep you posted!